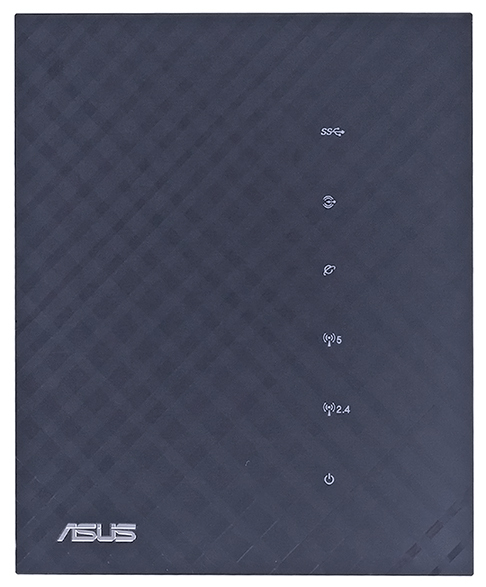 The marketing element of N600 and N900 in names of the products is of not much interest to us already for a long time, but today we are hosting an ASUS RT-N65U wireless router that has N750 written on its case. This device supports simultaneous operation under two wireless frequency ranges: 2.4 GHz and 5GHz, however with different performance. The maximum theoretically possible frequency throughput within 2.4 GHz range is 300 Mbps, while within 5 GHz frequency range RT-N65U can theoretically provide 450 Mpbs. Despite the fact that the device first appeared in our laboratory late in 2011, we managed to successfully finish all tests just recently. Well, let's not linger any more and pass directly to reviewing it in detail! 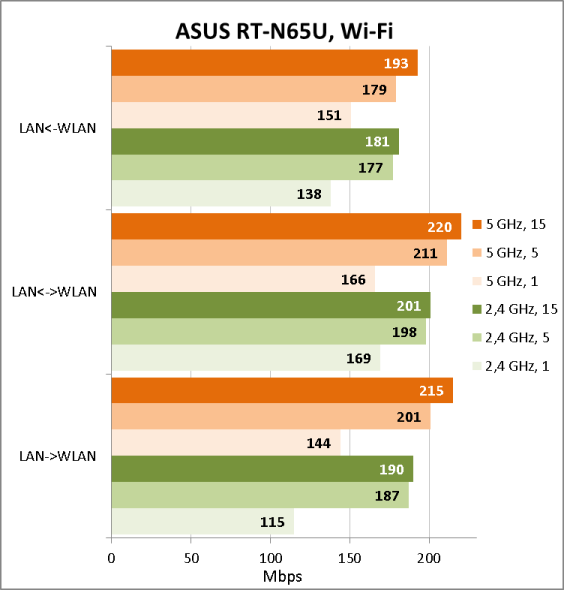 ASUS RT-N65U wireless router appearance is really similar to that of RT-N56U we had reviewed earlier: it has the same ribbed surface of the front panel, the same arrangement of ports, the same stand, and so on. The dimensions of RT-N65U are 172x145x60 mm including the support stand. To work properly the device needs an external power unit (included in the box) with the following characteristics: 19V and 1.58А. The only thing different between RT-N65U and RT-N56U is the rear panel, if you can call it this way. 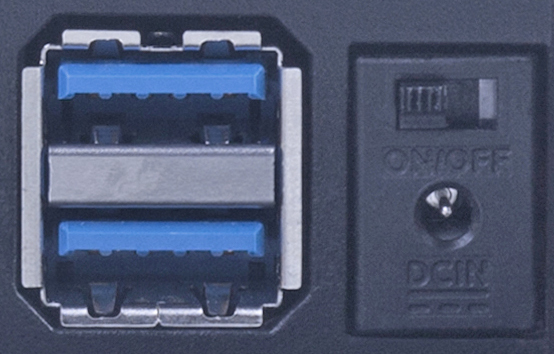 RT-N65U has two USB 3.0 ports and a power switch. However, its size, shape, and placement puzzled us. Couldn't it have been made a bit bigger or placed in a different spot? It'd be barely possible to reach it if there are USB devices connected to the router. 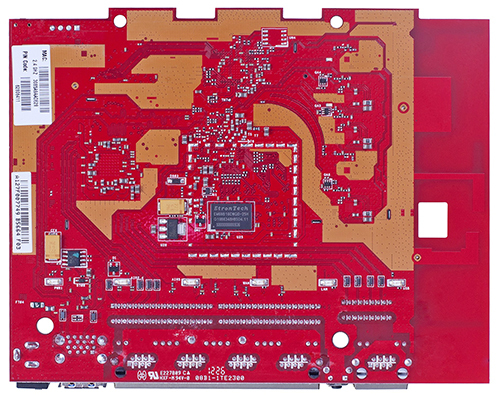 Insides of ASUS RT-N65U wireless router are one red textolite card, main elements of which are located on both of its sides, but are mostly covered with heat sinks and protective screens. Two RAM modules—16 MByte Winbond W9812G6JH-6 and 64 MByte EtronTech EM68B16CWQD-25H—and Asmedia ASM1042 host controller of the USB 3.0 bus are not covered by anything. 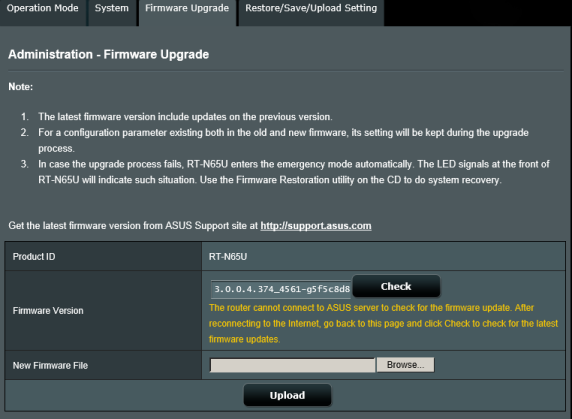 Firmware upgrade is carried out in Firmware Upgrade tab, Administration group in the web-interface. The procedure can be carried out really easily and doesn't require any technical knowledge from the user since s/he will only need to specify the file that had been downloaded from the vendor's website and click on Upload button. The whole process takes about three minutes. It'd be all really fine if not for a frustrating notification telling one about the obligatory manual reboot of the device after the firmware upgrade process is finished. We believe that the notification of this kind would be really helpful if shown before getting down to the firmware upgrade procedure since if there's no possibility to access the router physically to reboot it, the upgrade will make it fully unavailable. 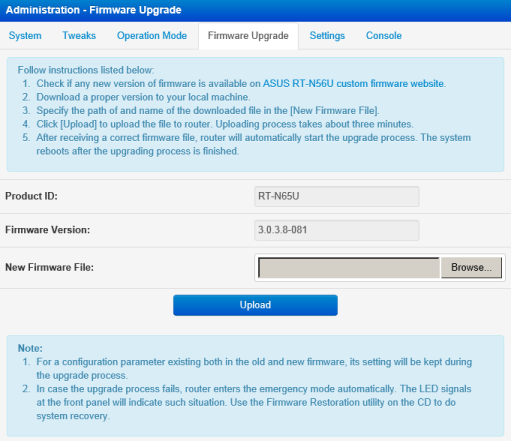 In case of a failure during the firmware upgrade, the administrator can use a special-purpose utility called Firmware Restoration that is meant to restore the firmware in ASUS wireless routers. The recovery process is easy enough; one just needs to choose a file with the applicable firmware and click on Upload button. The recovery process via the utility takes about three minutes, too. One can find out whether the firmware restore needs to be done or not by looking at the device Power LED. If it's the case, it will start slowly flashing in the rescue mode. 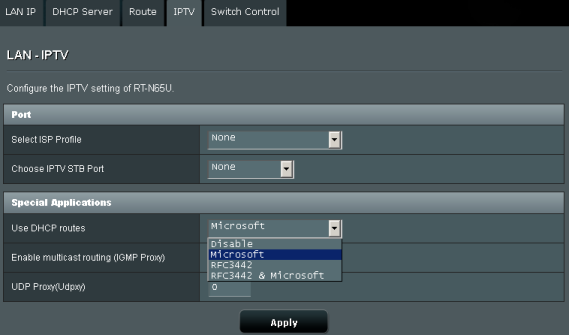 Also, it'd be fair to mention that the administrator can manually switch RT-N65U over to the rescue mode. To do that s/he only needs to hold Reset button for 10 seconds while the device is booting. Apart from the method of firmware restore in Windows described above, the user also can do it manually using any TFTP client and traffic analyzer. 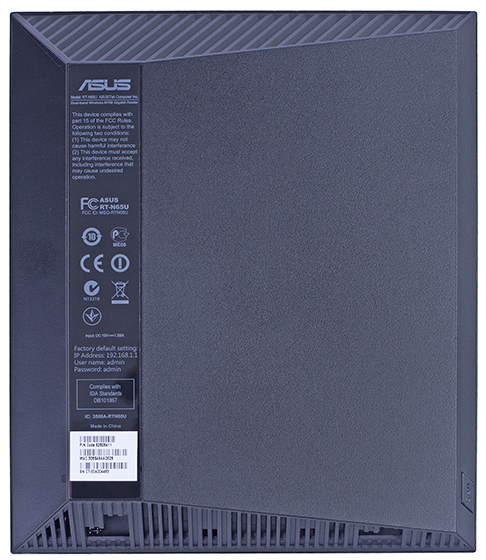 Once ASUS RT-N65U has loaded in the rescue mode, one will need to get connected to one of its LAN ports and enable traffic capturing. We did it using Wireshark utility. As you can see, the router sends out ARP requests about 192.168.1.11 from 192.168.1.1 really often. 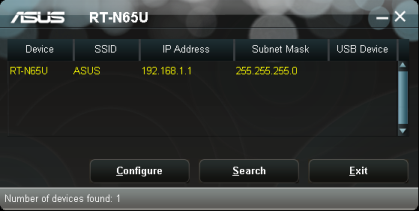 We assign 192.168.1.11 IP address to our test station, named the firmware file ASUSSPACELINK, and uploaded it to the router using TFTP. Naturally, we recommend our readers to use only official firmware recovery methods. Apart from the firmwares released by the device vendor, one can use alternative firmwares that are developed by, say, the project of Padavan user. Upgrading to the above-mentioned firmware is carried out in a conventional way. In order to switch back to the original firmware the user will need to enter Firware Upgrade tab, Administration group, Additional menu item in the web interface where s/he will be able to choose the corresponding file and upload it. RT-N65U web-interface is really similar to that of RT-N66U, the model by the same brand that we had reviewed earlier. That's exactly why we will not review all capabilities of its web-interface in detail, but only talk about the newest or most interesting features from our point of view. Support of HTTPS came to be a really nice new feature that can be used to access the device. 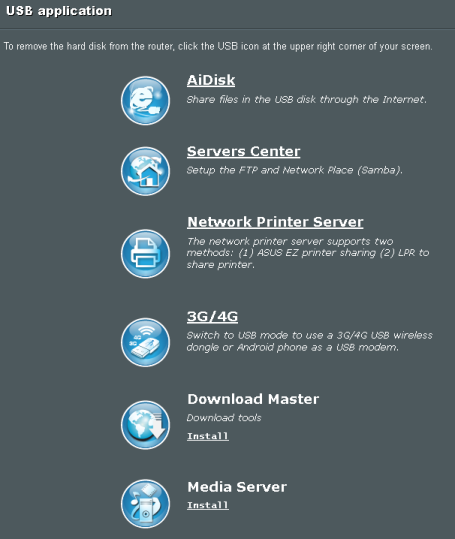 A new application for work with data stored on an external USB disc was added: it's called Media Server and lets the users gain access to the multimedia data over the network. New section AiCloud provides users of portable devices with wireless access to the data stored on a disc or resources in other nodes. 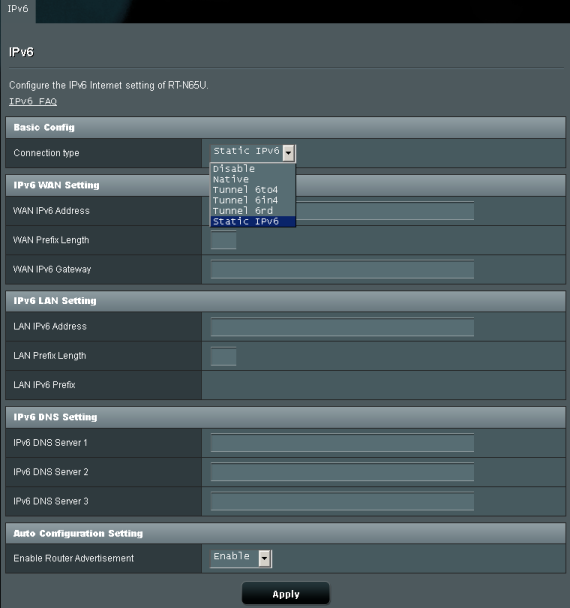 Tabs in Wireless group in Additional settings menu let the administrator manage operation parameters of the Wi-Fi module. Among the interesting features of the web-interface there is a possibility of specifying the channel capacity manually so that the device may always use 40 MHz channels as well as a possibility of separate management of wireless module operation scheduling on workdays and weekends. 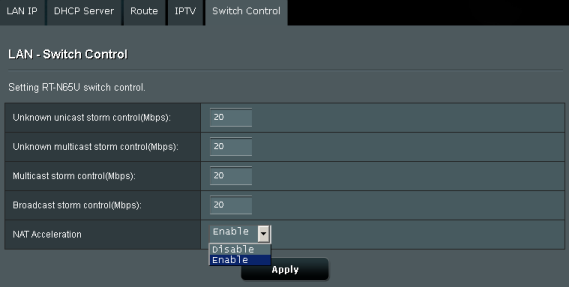 IPTV and Switch Control tabs in LAN group give one a possibility of flexible management of set-top boxes of the user and provide the user with tools that help him/her to limit the transfer speeds of certain types of traffic. 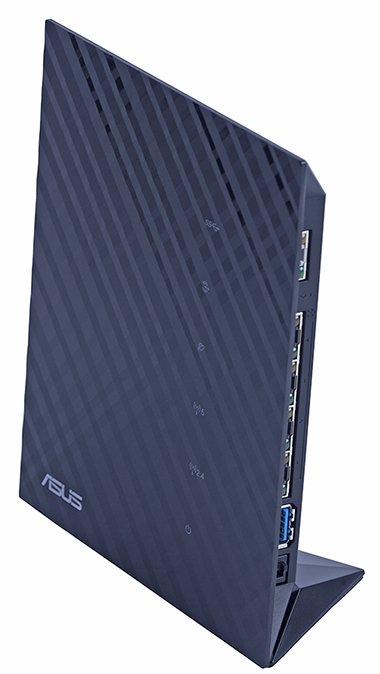 ASUS RT-N65U wireless router can get connected to the provider with both static and dynamic addresses as well as using the tunnel protocols: PPPoE, L2TP, and PPTP. Apart from it, the administrator can enable or disable passage of the following protocols from the local network to the WAN: PPTP, L2TP, IPSec, and RTSP. Also, one can enable PPPoE translation. The applicable settings are located in sub-sections in WAN group. Apart from operation with the old IPv4, the router under review also supports operation with the newest protocol, IPv6. These settings are located in the same-named group. 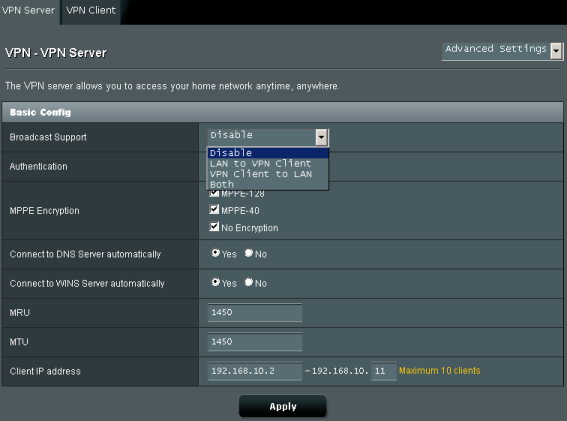 Remote access to the internal local network behind the router is possible via the Internet using a VPN server (PPTP) that is built in the router. 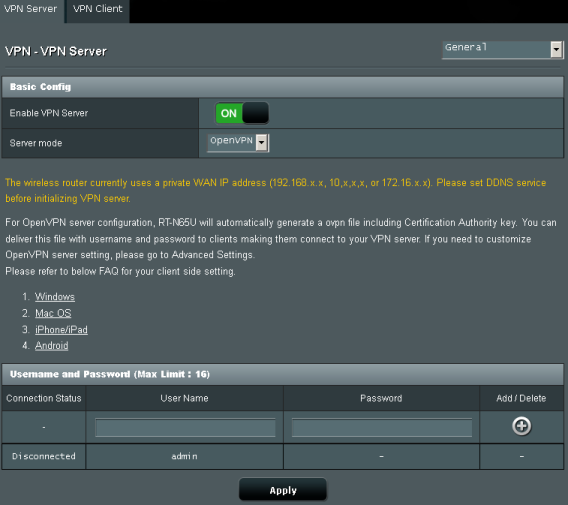 One can manage these settings in VPN tab in the menu. 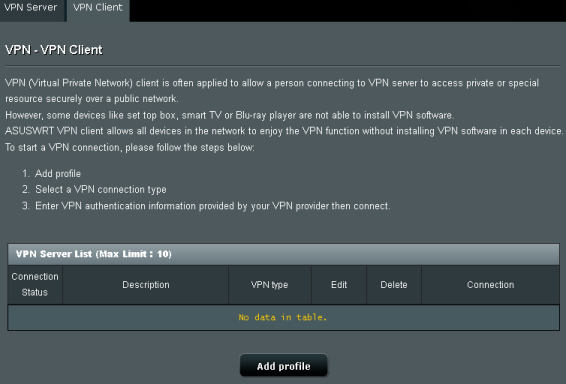 It's worth mentioning that in the latest firmware versions support of OpenVPN as a VPN server was added. 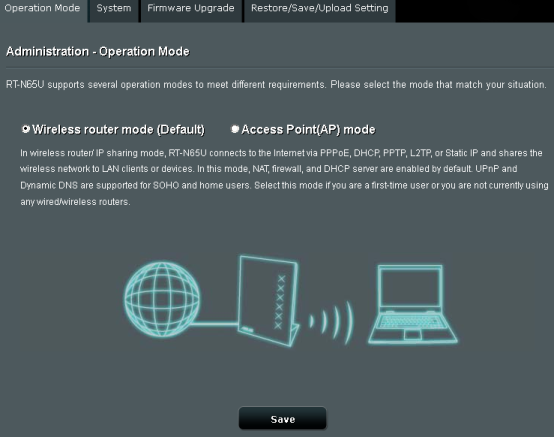 Operation mode and System tabs in Administration group let the user choose the device operation mode and specify the parameters of the user access to the router. That is where we bring a really short device web-interface review to a conclusion and pass on to the section dedicated to additional utilities. 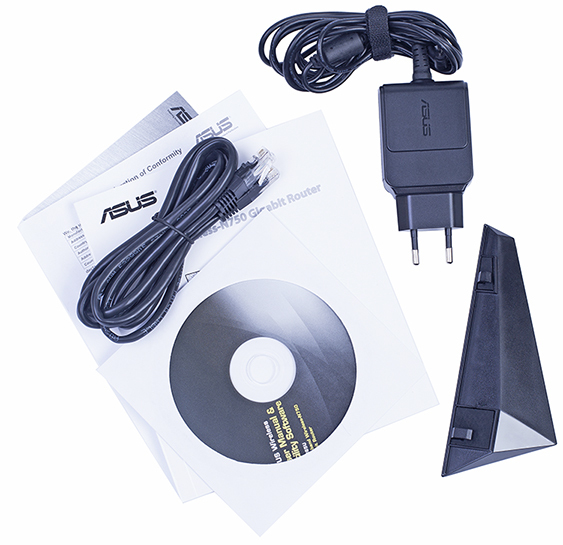 Users of ASUS RT-N65U wireless router can use several light but really helpful programmes. 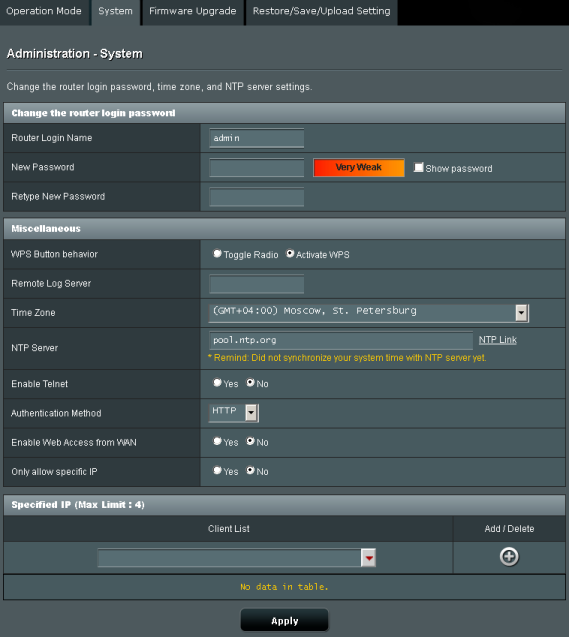 Among them there is Router Setup Wizard utility that helps one facilitate the procedure of connection of the device to certain large service providers in Russia. More detailed adjustment can be carried out using the wizard in the device web-interface. 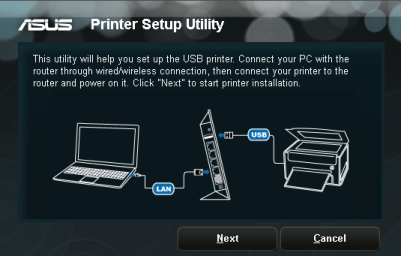 Printer Setup Utility is used in order to facilitate the connection of the network printer to a local node. Detection of wireless ASUS devices within the local network segment is carried out using Device Discovery programme. 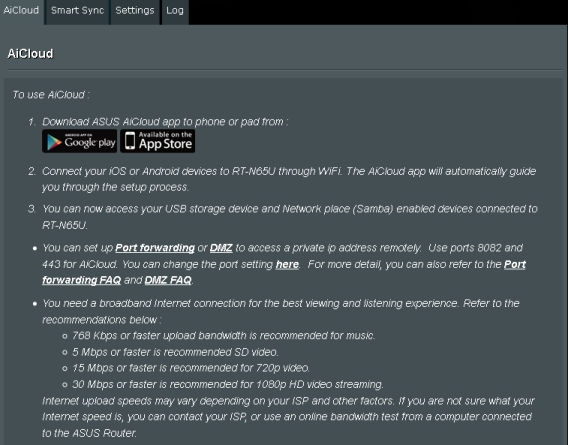 Also, there is another utility that is included in the utility pack of ASUS RT-N65U wireless router. It's called Firmware Restoration, but we had already reviewed its capabilities in this article. By default, the access to the device command line is prohibited. One needs to use System tab, Administration group in order to enable it. 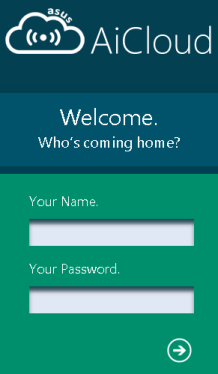 One will need to use the same login and password as for the web-interface in order to access the command line. It's admin/admin by default. Traditionally, there is BusyBox library installed there. BusyBox v1.17.4 (2012-11-07 02:07:05 CST) multi-call binary. Looks like /rom/Beceem_firmware catalogue features files that are somehow associated with Yota service provider. 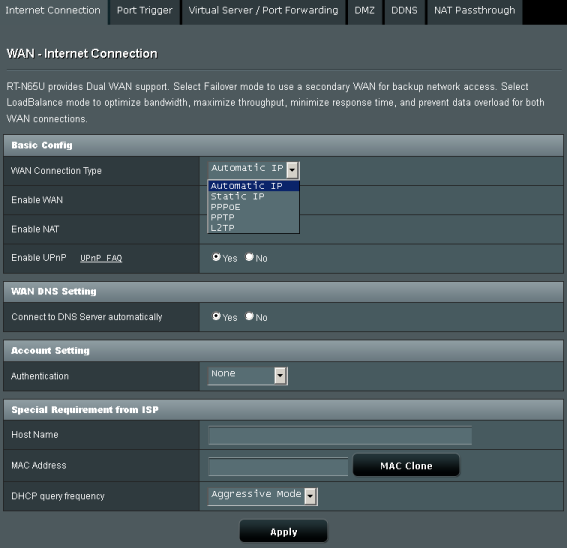 Let's find out what sessions are set by the clients to the router using netstat command. The first testing procedure we always begin our testing section with is estimating the booting time of the device, which is a time interval starting with the moment when the power is on until the first echo reply is received through ICMP. 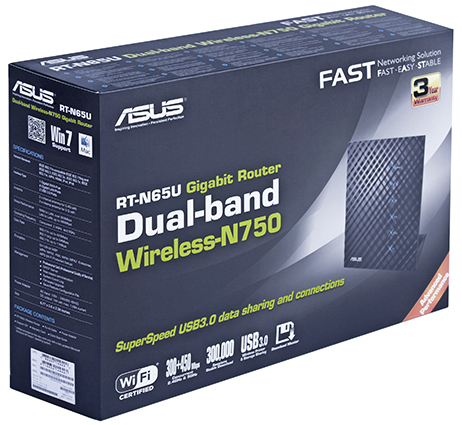 ASUS RT-N65U wireless router boots in 57 seconds. We believe that this result is decent. The second test was a security scanning procedure, which has been carried out using Positive Technologies XSpider 7.7 (Demo build 3100) utility. 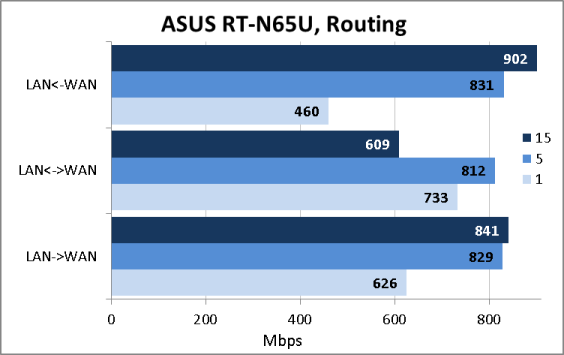 We decided to begin the performance tests of ASUS RT-N65U with measuring user data transmission speeds in the wireless segment of the network. The diagram provided below shows speed values that we received in both of the frequency ranges. Then we decided to carry out the measurements upon operation only in the wired segment. 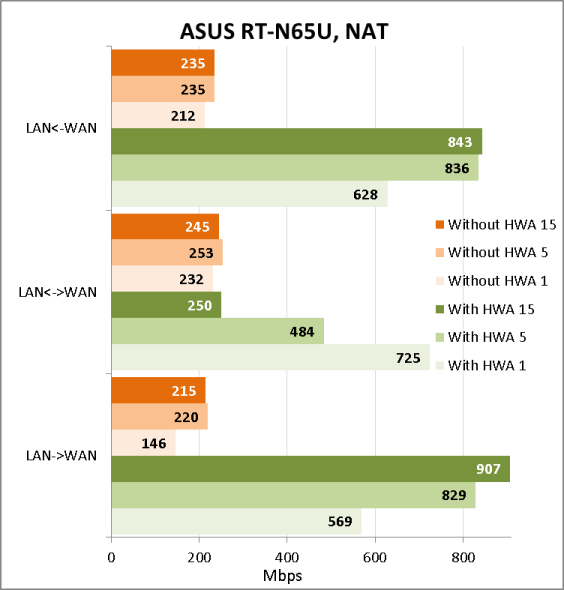 ASUS RT-N65U supports NAT/PAT hardware acceleration. We decided to find out data transfer speeds both when the acceleration was enabled and disabled. Also, the wireless router under review possesses a possibility to switch off the translation, i.e. it simply can carry out solely routing functions. 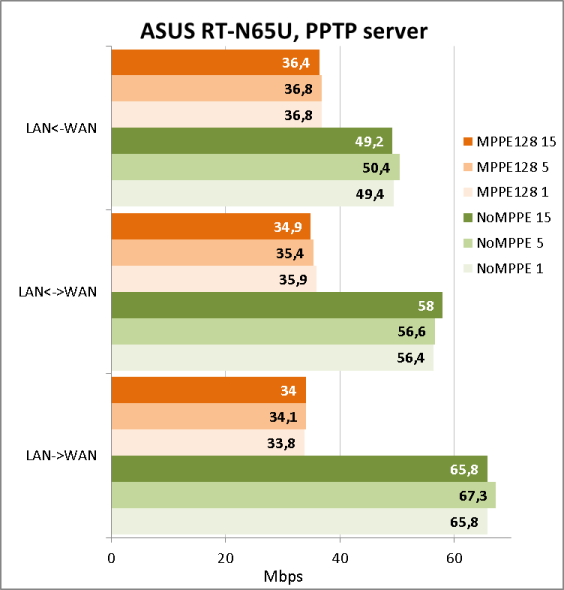 Neither have we overlooked the performance of the router upon connection to the provider using PPTP. Results of the measurements for encrypted tunnels and tunnels without encryption are presented on the diagram below. 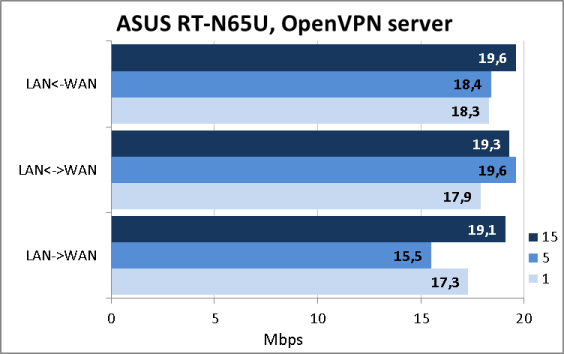 ASUS RT-N65U has a built-in feature of acting as a VPN client and server either for connection to a remote corporate network or providing remote users with access to the local network of the device. 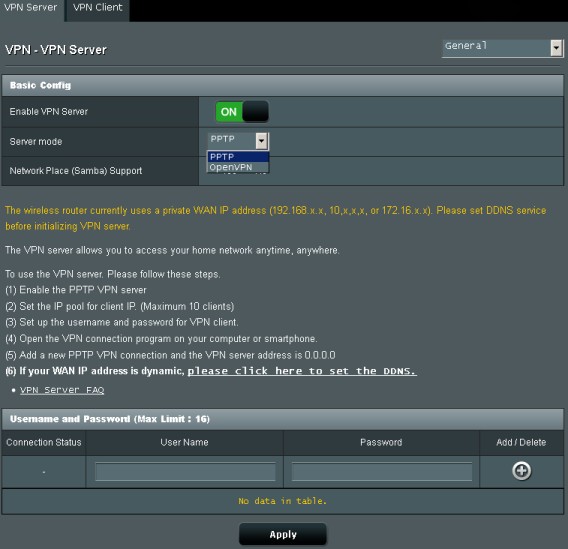 The following protocols are available when the device acts as a VPN server: PPTP and OpenVPN. 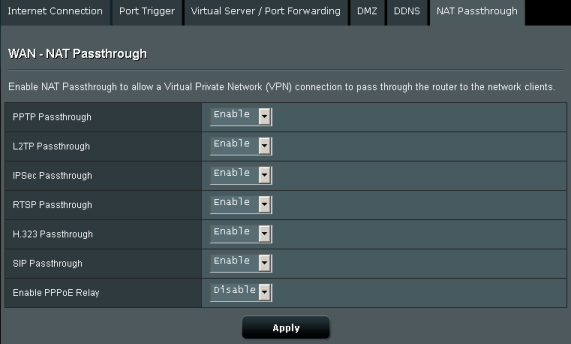 Whilst in case RT-N65U is used as a VPN client, the users will be able to get connected to it using the protocols: PPTP, L2TP, and OpenVPN. We detected certain problems upon usage of encrypted tunnels during testing and therefore we passed this information over to the vendor right away. Eventually, these vulnerabilities were completely fixed in 3.0.0.4_374_4230 firmware. 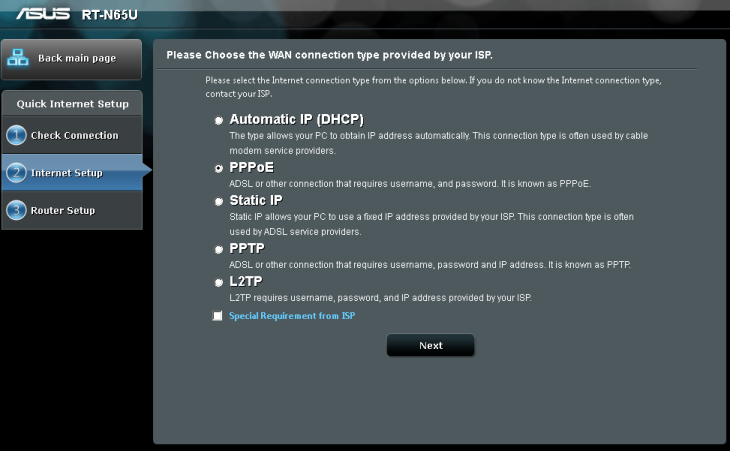 Apart from IPv4 support, the router under review also lets the user establish connections using IPv6. Unfortunately, we couldn't make it permit connections from the WAN to LAN. However, we were pleasantly surprised at the rate of LAN->WAN data flow as we managed to transfer data at the speed of about 900 Mbps. We also couldn't overlook a possibility of access to the data stored on an external HDD that is connected to the device via USB. When the article was almost done, a new version of the firmware—3.0.0.4.334—appeared on the vendor's website. Among new things that it features is improvement in data access speeds via USB. Naturally, we upgraded the device to the above-mentioned firmware and performed measurements for NTFS once more. 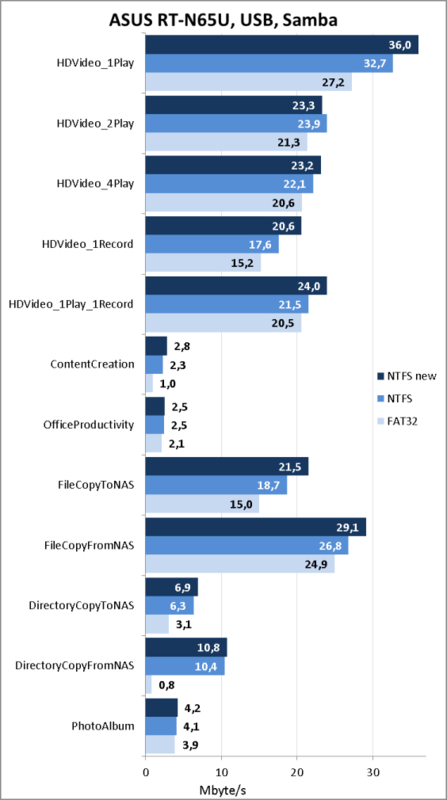 The received values are provided under NTFS new range on the diagram presented below. It's worth mentioning that the access speed to the data stored on an external HDD becomes a key factor that influences the decision of purchase of this or that device. A high speed upon usage of ASUS cloud servers becomes a really sought-after feature since the servers allow for storing of the most important data on the company's servers and accessing them remotely when needed. We already saw similar functionality in certain NASes that we tested earlier and currently the common routers for home use have it too. 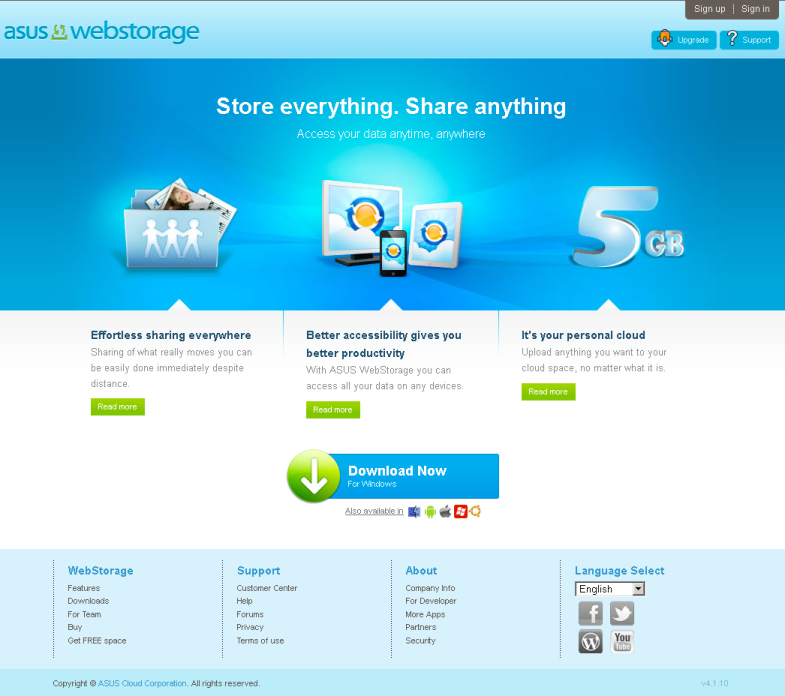 Also, now users can create their own cloud storage areas and allow certain people access to them. 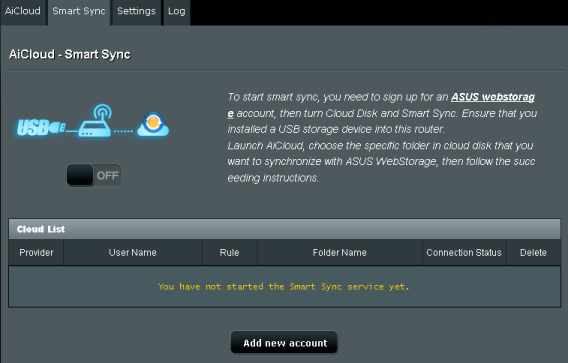 One can access AiCloud settings in ASUS RT-N65U router by entering its LAN interface address using HTTPS. That's where we draw the testing chapter of ASUS RT-N65U wireless router to a close and move on to summing it all up. 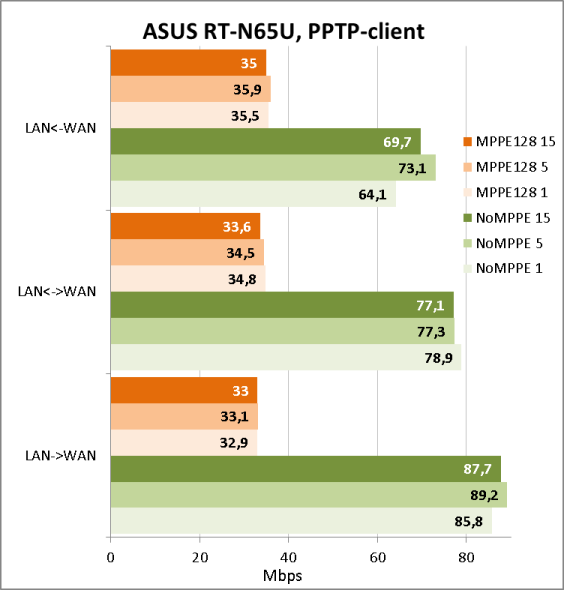 Generally, we are glad about ASUS RT-N65U wireless router we tested. It shows sustainable data transfer speeds and routing speeds in the wireless network segment. 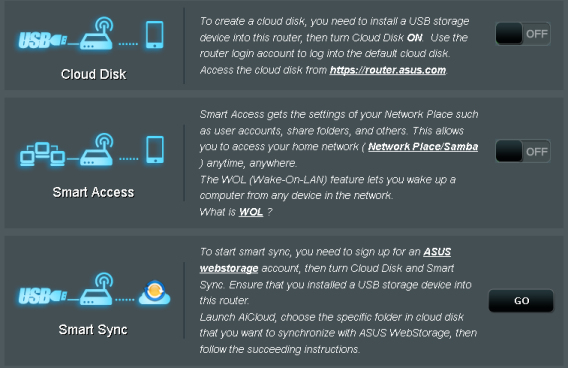 Support of ASUS AiCloud provides improved capabilities of its integration with mobile devices as well as facilitates remote access to the data stored on an external HDD. 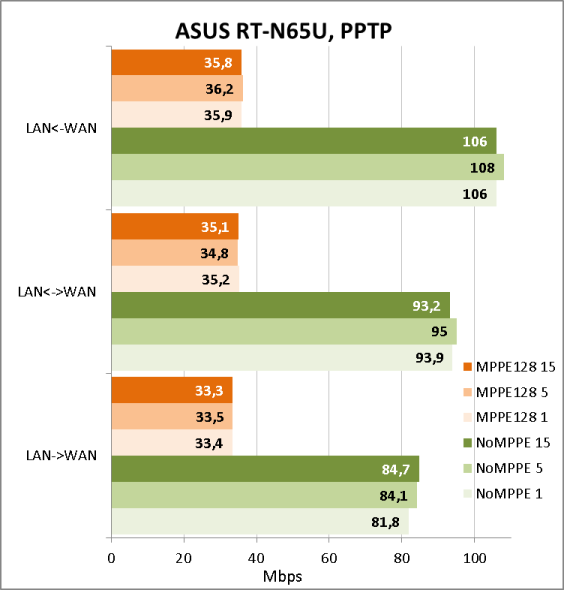 As of when this article was being written, the average price for ASUS RT-N65U in Moscow online shops was 4300 roubles.